Collaborator, apprentice, assistant, fabricator—this project considers the unacknowledged labors that make major artworks possible. Pink bookmarks printed with historical research and transparent pages depicting the work of these invisible makers challenge our notions of authorship in the art history tome, Gardner's Art Through the Ages. Collaborator, apprentice, assistant, fabricator—this project considers the unacknowledged labors that make major artworks possible. 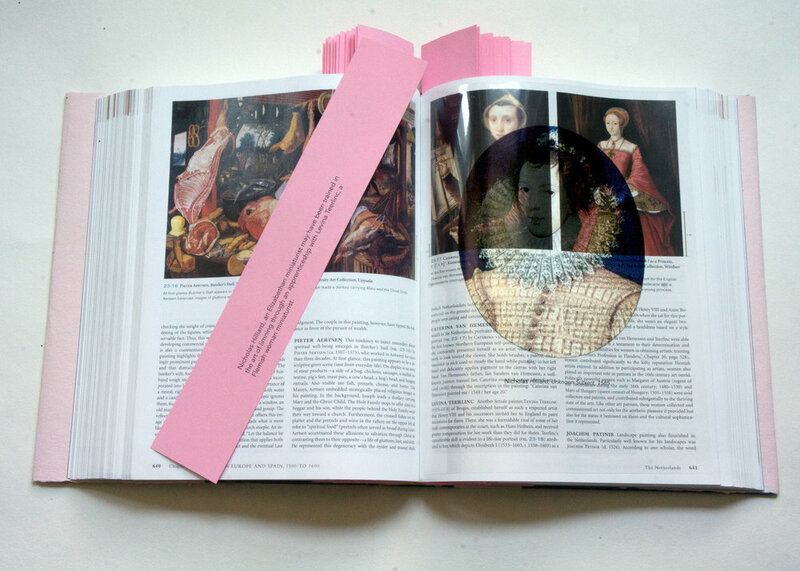 Pink bookmarks printed with historical research and transparent pages depicting the work of these invisible makers challenge our notions of authorship in the art history tome, Gardner's Art Through the Ages. The book is covered in pink handmade paper.